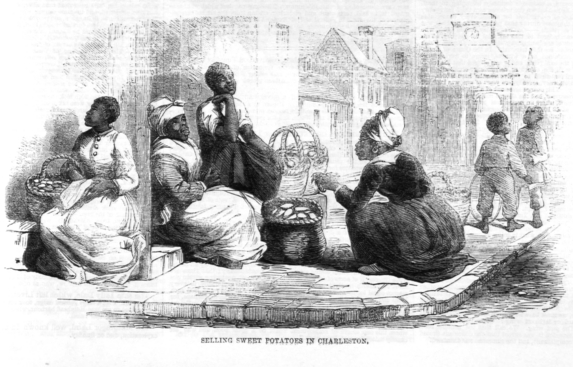 Slaves commonly sold produce like sweet potatoes or peanuts and other goods on the streets of Charleston. Slave owners coordinated this “slave-hiring system” to help raise additional income for the plantation. Mary Reynolds, a former slave, recalled, "Sometimes massa let niggers have a li'l patch. They'd raise taters or goobers. They liked to have them to help fill out on the victuals…The niggers had to work the patches at night and dig the taters and goobers at night. Then if they wanted to sell any in town they'd have to git a pass to go. They had to go at night, cause they couldn't ever spare a hand from the fields." A British artist sketched this scene after visiting Charleston in 1853. Source | The Illustrated London News (Feb. 2, 1861), vol. 38, p. 94. (Copy in Special Collections Department, University of Virginia Library); available from The University of Virginia, The Atlantic Slave Trade and Slave Life in the Americas, http://hitchcock.itc.virginia.edu/Slavery/details.php?categorynum=11&categoryName=&theRecord=42&recordCount=68. Cite This document | Eyre Crowe, “Selling Sweet Potatoes in Charleston,” HERB: Resources for Teachers, accessed April 23, 2019, https://herb.ashp.cuny.edu/items/show/1624.